Earth Recordings have spent a lot of time and money on So What If Im Standing In Apricot Jam. 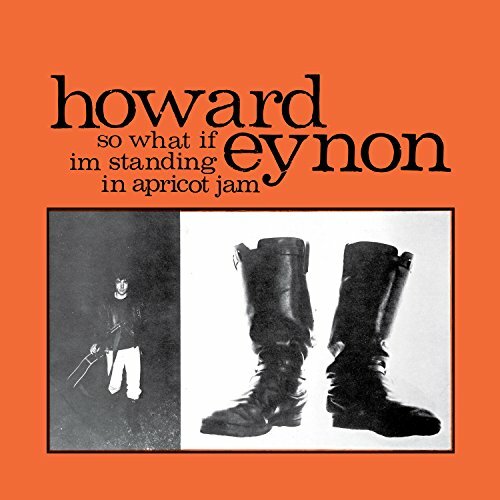 It comes attractively packaged (orange vinyl) with an interesting back-story about Howard Eynon, originally from Cambridgeshire, leaving the family farm in Tasmania on a motorbike to seek fame and fortune as an actor. He eventually found himself back in Tasmania at Spectangle Productions in Hobart. It is the recordings he made there, originally released in 1974, that you hear here. Earth make several grand claims for this album, calling it an ‘Acid Folk masterpiece’ and comparing it to the works of Nick Drake, Syd Barrett and also to Paul McCartney’s Ram album. This is unfortunate as the expectation crushes what is a likeable enough album. Howard Eynon plays guitar and sings, both competently. His songs are from the slightly silly end of psychedelic folk (Tyranasaurus Rex, Donovan, Incredible String Band). He even directly mentions the Donovan influence on Hot BJ (don't search for that on your work PC). However, there is nothing here that is as good as any of the aforementioned artists. Eynon is closer to Ralph McTell in his (often light-hearted) performances. He even steals the chords and melody from Streets Of London on Now's The Time. So What If Im Standing in Apricot Jam is by no means a bad album. The interplay between the violin and guitar on the mainly instrumental Village Hill is exceptional. Shadows and Riff is also lovely, before it meanders away from the initial song. The quality of the recording (approaching the John Wood/Joe Boyd level) and the contributions of the local musicians on various instruments also suggests that there might have been a scene around Spectangle that, given the artists and songs, could have made it a Tasmanian Witchseason. However, just because something was recorded in the late 60s or early 70s and ignored, it doesn’t make it a lost classic. Buried treasure does exist (Bill Fay, for example), but there are also a lot of people who didn’t make it simply because they were just OK. Howard Eynon is a likeable chap, with a way with words and a tune. He's good, he's just not that good. There's not many crates left to dig into.